Athena’s Advanced Academy was created by Dr. Kirsten L. Stein, Ed.D. who has been involved in the field of education for three decades. She graduated with a B.S. in Education and taught elementary school in the public school system. During her time as a classroom teacher, she spearheaded the district’s involvement in inclusion practices and the use of paraprofessionals in the classroom. Dr. Stein continued her own education and earned her M.A. Education degree with a focus on team building. And continued to be involved in the field of education while homeschooling her profoundly gifted children. She applied her background as an educator and formed Athena’s Advanced Academy to broaden the scope of learning for gifted children. This passion was her doctoral focus in earning her Ed.D. in Educational Leadership. Kirsten strives to create a supportive community of parents and learners through her roles as C.E.O. and Instructor at Athena’s Advanced Academy. The Bookform pilot project will be overseen by Athena’s Advanced Academy’s Online Course Facilitator, Dr. Monita Leavitt. Dr. Leavitt is an international gifted education specialist, author of Building a Gifted Program: Identifying and Educating Students in Your School (2007), contributing author of Exceptional Needs Standards (2010), co-authored Let it Flow (2014), and chapter author of Make them Shine (2015) and Your Passport to Gifted Education (2017). Former Affiliate Director of California’s Future Problem Solving Program. Dr. Leavitt taught a gifted program for 25 years in CT and lectures internationally, including at the World Gifted Conferences. 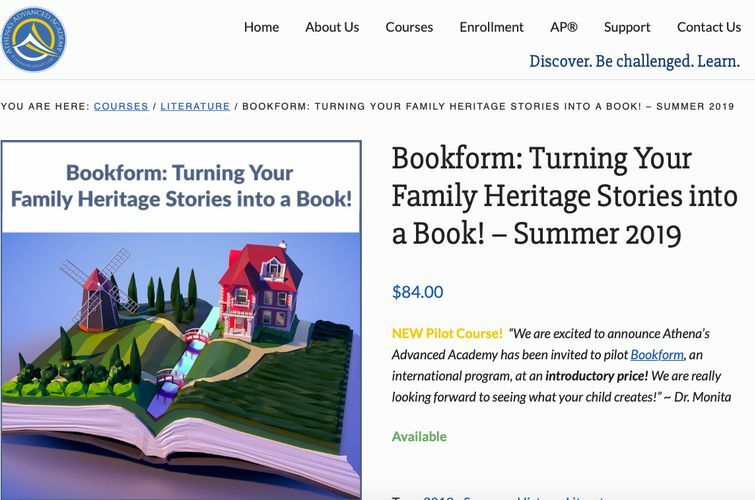 Athena’s Advanced Academy will pilot ‘The Family Book’ project using Bookform’s online program to guide students to collect stories from their family or people in their community as ‘Social Emotional Learning’, that also produces a polished book product the students are proud to present and families can treasure for forever. Q&A template questions guide interviews and new conversations. Voice-to-text AI instantly captures spoken stories in audio & text. Collaboration enables invited family to automatically contribute content & photos directly into the book. All content can be edited, rearranged or deleted and is private until shared. Digital & Print book – all content is automatically collated into sections & chapters of a printable digital book. Books can be shared online or printed on-demand. Other pilot projects are underway in Singapore, with the Global Indian International School GIIS. They are doing the ‘Family Recipe Book’project. Students are collecting their family’s favourite recipes and the stories about why that food is special. Students share their stories in the classroom for peer bonding and collaborative editing in lessons on literacy, history and culture. Successful pilots completed last year with The King’s School and Tangara Girls doing the ‘Write of Passage’ project at Arcare Aged Care Homes. The projects were featured on national television on the Channel 7 Sunrise show and the teachers received awards from the Education Minister on ‘World Teacher’s Day’. The book presentation ceremonies on Grandparent’s Day saw crowds of students, their families, residents and their families, come together over the shared bonding experience and the joy of a tangible keepsake to treasure forever.